The colour-enhanced images shows a storm rotating counter-clockwise with a wide range of cloud altitudes. 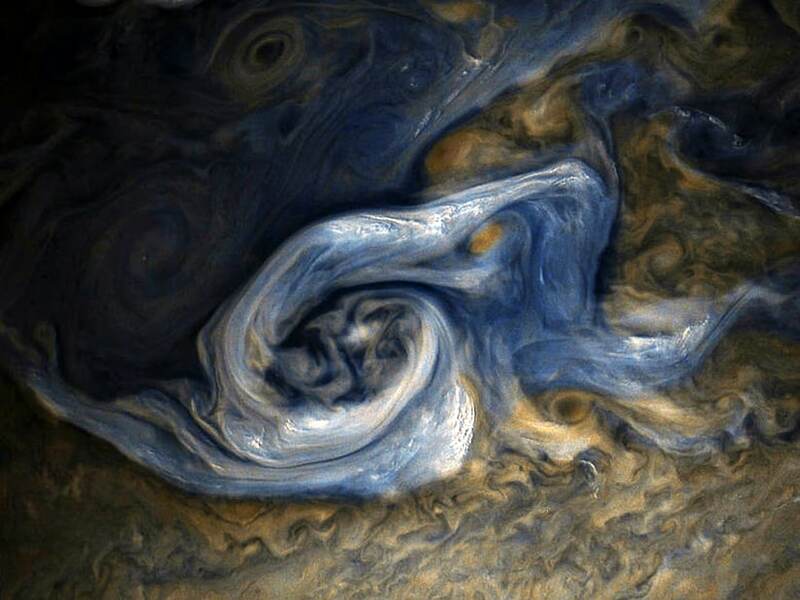 NASA's Juno spacecraft beamed back a stunning image of a massive, raging storm in Jupiter's northern hemisphere, captured by the probe during its ninth close flyby of the gas giant planet. The image was taken on 24 October, when the spacecraft was about 10,108 kilometres away from the tops of the clouds of Jupiter. The colour-enhanced images shows a storm rotating counter-clockwise with a wide range of cloud altitudes. The darker clouds are expected to be deeper in the atmosphere than the brightest clouds. Within some of the bright "arms" of this storm, smaller clouds and banks of clouds can be seen, some of which are casting shadows. The bright clouds and their shadows range from about seven to 12 kilometres in both widths and lengths. These appear similar to the small clouds in other bright regions Juno has detected and are expected to be updrafts of ammonia ice crystals possibly mixed with water ice. Citizen scientists Gerald Eichstadt and Sean Doran processed this image using data from the JunoCam imager, NASA said.